All things being equal, a larger list is a more profitable one. But all things are rarely equal! I’ve helped clients with teeny tiny lists who produced 10 times the income of a much, larger list. I’ve also partnered with affiliates and purchased solo ads to email lists where the small lists were a home run while the large lists struck out. Why do tiny lists often outperform much bigger ones? A lot of people don’t like to talk about this, but you run into more problems getting your emails delivered when you start getting near 100,000 subscribers and up. Some clients overcome this by splitting up their large lists and staggering the times of mailings along with sending to the buyer lists first. But that’s not the biggest problem causing poor performance. The more targeted the list, the better the results. Why are people on your list? What are they interested in? And how focused are you on delivering your points of difference? Let’s say you have a list of 200 dentists who oversee multiple practices and let’s compare that to a list of 10,000 bowlers. Pretty ridiculous comparison, right? The dental list is going to be much more valuable assuming you hit the other elements in this email. They’ll invest more in offers that improve their return on investment. But what happens when you think about your Ideal Client from day one…use a Lead Magnet designed to attract them…and segment your lists by what they’re most interested in? You produce incredible results others can’t touch in your market. Share a message that stands out in your marketplace. Be controversial. Share content and value that sets you apart from the competition. Share case studies from your clients. Demonstrate expertise. So many people regurgitate content they read in someone else’s book. They’re not confident in it, because they’ve never put it into practice. Be a real expert in your market. Then your emails and other content will reflect that expertise. You stand out today simply by knowing what you’re talking about! I’ve reviewed many emails where they grabbed people’s attention with a great story, shared valuable tips, and then fell to pieces when they made an offer. Be confident in what you sell. If it’s not the absolute best solution for at least a portion of your market, then sell something else! If you’re not 100% sold on your offer, no one else will be either. When you know your solution can change people’s lives, you owe it to them to share it every chance you get. Because if you don’t, they’re going to continue suffering and waste money on ineffective solutions. It’s your fault for not bolding sharing the solution that can set them free. I’ve seen way too many people build big lists that are next to useless because they’ve trained their subscribers to only expect ‘free’ information. When they finally make an offer, there’s a rebellion. Mix personality, content, and offers. And let people know you’re a business from a day one. Change lives by the products and services you sell. As often as you have something to say. That might be once a week, several times a week, or several times a day. The more emails you send, the more money you make as long as they’re authoritative emails with irresistible offers. If you’re worried about people unsubscribing from your emails, you’ve already lost. Send emails. Let people unsubscribe. Why worry if non-buyers are unsubscribing? They’re simply reducing your cost of hosting. 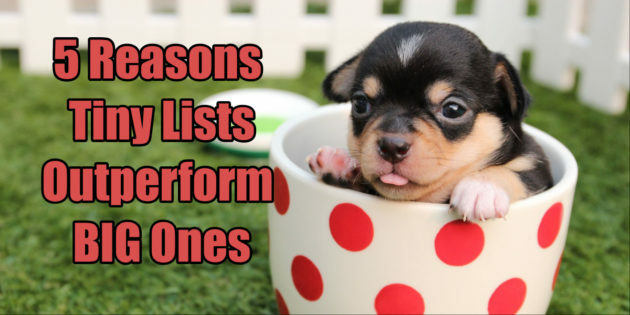 These 5 tips are just a few of the reasons tiny lists can outperform big ones. You can tap into my complete step-by-step system for generating more money from any sized email list at Autoresponder Alchemy. It shows you how to create emails that convert subscribers into buyers…while building your authority and creating lifelong fans. It’s the system that set me free from a series of dead-end jobs way back in 1996 and it continues to produce millions of dollars in income for my personal clients today.